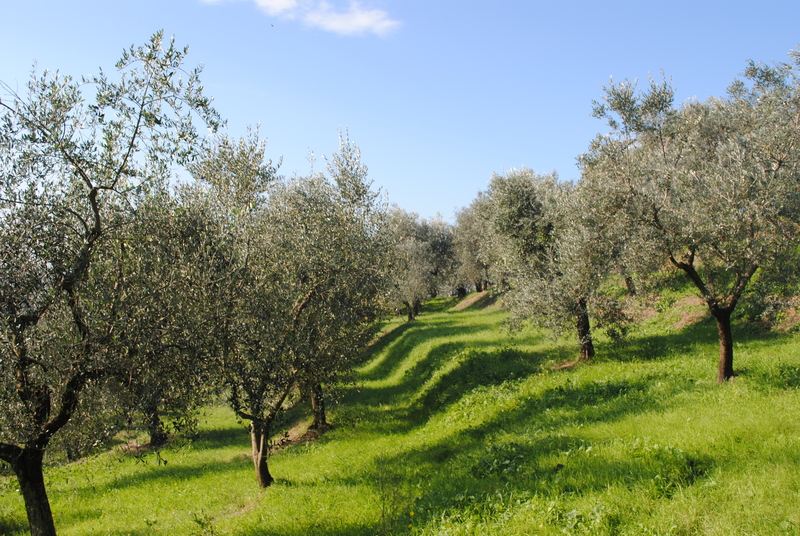 Our olive grove is situated on steep, terraced hillside and has approximately 350 mature trees. 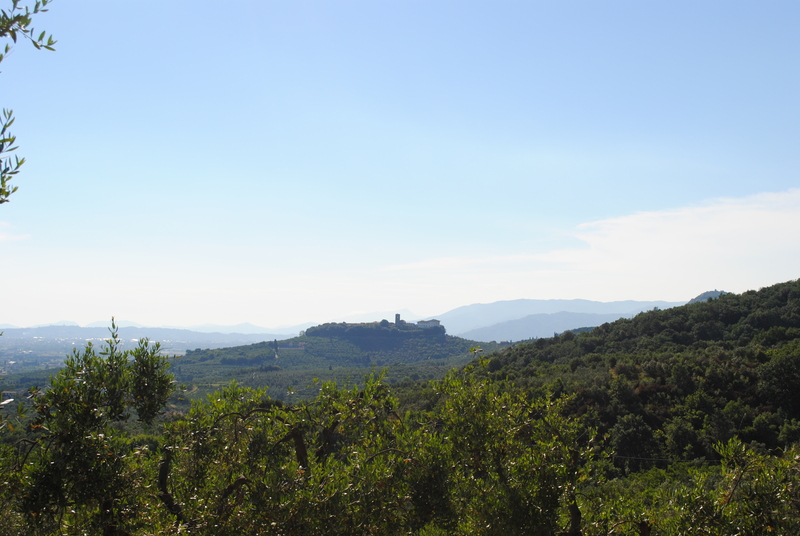 The grove is wrapped around a hill in the beautiful Montalbano area of northern Tuscany. It overlooks the spa town of Monsummano Terme (where Michele grew up) and has spectacular views of the Monti Pisani, the mountain range separating the towns of Lucca and Pisa. Before we took over the olive grove in September 2012, it had lain abandoned for five years. Sadly, this is now a common occurrence. As younger generations turns their back on agricultural work there are fewer full-time farmers left to cultivate the land and many vineyards and olive groves have been neglected or abandoned. Restoring our grove to its former glory is a time-consuming task which we are completing gradually. When we took over, the olive trees were tall and in desperate need of pruning and the grove was overgrown with weeds and brambles which needed to be cut back. The only advantage of taking over an abandoned grove is that we do not need to worry about pesticides or fertilisers used by the previous farmer, as the field has been untreated for at least 5 years. 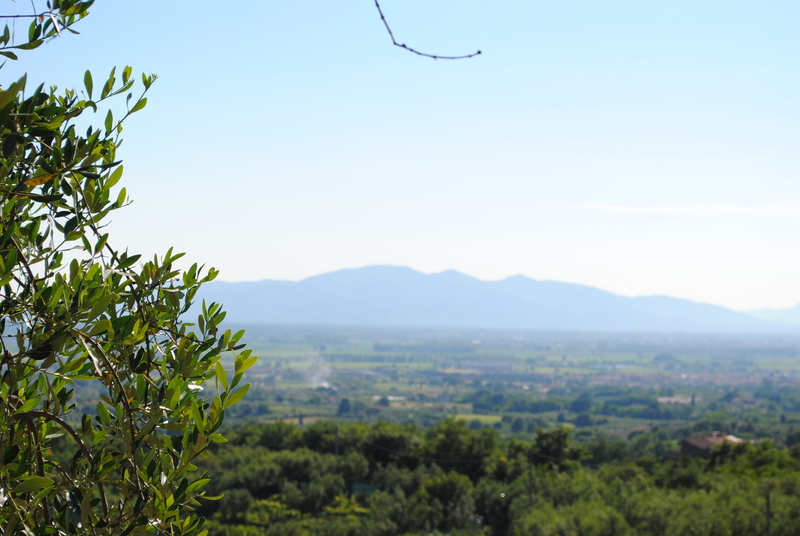 Our olive grove is in Montalbano, a small area between Florence and Pisa, in the province of Pistoia. This predominantly hilly area is also known as le colline di Leonardo, and Da Vinci’s birthplace (complete with house and museum) is a ten-minute drive from our grove. The landscape is a mixture of ancient woodland and cultivated land. As you drive along la Strada dell’Olio e del Vino del Montalbano (‘the Road of Oil and Wine’) and ascend Montalbano’s hills you pass vineyards (largely producing Chianti Montalbano DOC), then olive groves, before finally reaching ancient chestnut forests at the summit (necci – chestnut flour pancakes – are a local speciality). Montalbano is rich in history and the hillsides are populated by Roman and Etruscan archeological sites, medieval churches and Medici villas. The area roughly corresponds to the Barco Reale, a Medici hunting reserve, and part of the wall remains intact today. How wonderful! That said, I’m sure there is lots of hard work involved. I would love to visit your area. You should definitely come and visit the Montalbano area, it’s very different to Garfagnana but equally wonderful! Tuscany is so varied, we are very lucky to have so many fabulous places within easy reach. I enjoyed reading your blog. We’ll stop by and say hi the next time we’re in your neighborhood. Beautiful work. Breath-taking landscapes become your daily reward and treat! We love chestnut flour too. There’s a local Hungarian bakery here that makes a Chestnut Chocolate torte. Perhaps you will start an inn & a volunteer farming program for us all stuck in these cities? We could all to offer a few weeks of our labor for this & a little hospitality! Much success to you! Thanks for the kind words. We love chestnut flour pancakes with ricotta and/or nutella – very typical here. Good luck with your city growing! Thanks for your Like! This is indeed a beautiful area of Italy.We greatly enjoyed our visit to it a few years ago! Thanks for visiting – yes Tuscany is wonderful, we’re very lucky. I am sure from reading your blog that you must agree with your readers on your charmed status but I realize as well that it must be a lot of very hard work. Brava!!!!! Well Done! Grazie! Definitely hard work sometimes, but we can’t really complain, it’s such a beautiful place to spend time. What a well written and interesting article on your olive grove you have provided. May it continue to grow and flourish. Thank you for visiting my blog. Thank you very much! I’m glad you enjoyed reading and good luck finding continued inspiration in nature! Lovely grove. Thanks too for visiting my blog. This is so interesting! I fell in love with San Gimigiani years ago and its impressive towers. Such a spectacular area. Thank you for visiting my site. We don’t have olives here, but the apples are top notch! Thank you! San Gimignano is a beautiful, special town. It is a wonderful part of the world. And good luck with your yummy apples – that is one of the things from the UK that I miss the most – here they have a limited selection, only golden delicious, gala, and Granny Smiths. Your area sounds so beautiful. One day, after the children are raised (2 down 2 to go) my husband and I will travel and Italy is on my list. You absolutely should visit one day, it’s a beautiful and extremely diverse country. In the meantime I hope you can enjoy dreaming and planning, that’s half the fun I think. Thank you for stopping by! How marvelous! It must be like living inside an Old Master’s oil painting. Thanks for visiting! Is is indeed a beautiful environment in which to live and work.